Failure Of Latest HIV Vaccine Test: A 'Huge Disappointment' : Shots - Health News An oversight committee halted a big clinical study of an experimental HIV vaccine after a peek at preliminary results showed there was no way the study would be able show the vaccine works. More vaccinated people became infected with HIV than those who got placebo shots. 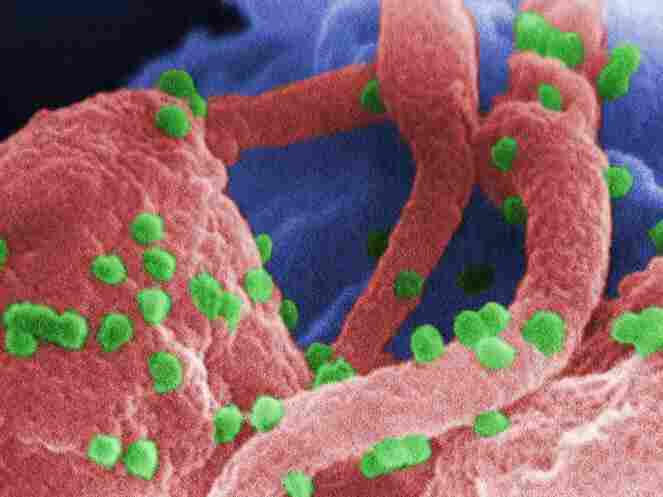 The green dots are HIV virus particles on a human white blood cell. The largest current study of an AIDS vaccine, involving 2,500 people, is being stopped. After an oversight committee took a preliminary peek at the results this past Monday, they concluded there was no way the study would show that the vaccine prevents HIV infection. Nor would the vaccine suppress the wily virus among people who get infected despite being vaccinated. So they pulled the plug on HVTN-505, as the study is called. "It was a huge disappointment," says study leader Dr. Scott Hammer, who learned the bad news at 1:45 Monday afternoon. Hammer tells Shots the blow was all the more crushing because just a month earlier the 19-city study had met its goal for participants. "It was a big traumatic event to put all this effort in and then have the vaccine trial stop because of futility a month after we completed enrollment," Hammer says. He's chief of infectious diseases at Columbia University College of Physicians and Surgeons and a leading AIDS researcher who's been fighting the virus since the pandemic's beginning. Participants are being notified that no more shots will be given. They will be followed for up to five more years to glean as much insight as possible from the $77 million, federally financed project. It's another swerve into the ditch for AIDS researchers' on the long road to devise a vaccine that can prevent HIV infection, or at least blunt it, in a significant proportion of people at risk. The only success so far has been in a study involving 16,000 volunteers in Thailand. Published in late 2009, it showed a reduction in the rate of HIV infection by only 31 percent — not enough to deploy as a public health weapon, but a glimmer that encouraged researchers to think a protective vaccine is possible. However, the latest big hope was dashed by these numbers: Among those in the just-halted study who got the vaccine, 41 people got infected with HIV, compared to 30 who got placebo shots. That doesn't necessarily mean that the vaccine actually increased people's risk of HIV infection, because the difference is not statistically significant. But Hammer acknowledges that possibility. "It's clear evidence the vaccine didn't work and may in some fashion put them at greater risk — we don't know that," he says. "The major message is they were not protected." It may put the kibosh on the future use of an weakened cold virus, called Ad5, that was used as a vector — a vehicle carrying selected HIV genes that was used as part of the complicated four-shot vaccine regimen. The possible riskiness of using the Ad5 vector was raised by results of an earlier HIV vaccine trial called STEP back in 2007. That study was halted prematurely because of evidence that those who got the vaccine had higher risk of HIV infection. The designers of the big HVTN-505 study hoped they'd avoided that problem by enrolling only people who had no evidence of prior exposure to the Ad5 cold virus. They reasoned that antibodies directed at the cold virus could have interfered with its efficacy as a vaccine vector and somehow increased the risk of HIV infection. Other, early-phased HIV vaccine trials are using the Ad5 vector. Those will be reevaluated in light of the new findings, Hammer says. "My own feeling is it's curtains for the Ad5 vector," Hammer says. Even more ominous is the possibility is that it's not the vector that may be increasing the risk but rather any vaccine component that stimulates immune cells to attack HIV. Since that's precisely what vaccines are supposed to do, that would be a catch-22 and a serious setback for AIDS vaccine research. But it's too soon to jump to that conclusion. Leading AIDS researchers were disappointed by the failure of HVTN-505 – but not necessarily surprised, given the history of previous attempts. "In a lot of ways, we're not much farther down the road than we were a number of years ago," Dr. Robert Schooley of the University of California, San Diego told MedPage Today. "We understand a lot more about how (HIV-infected) people respond to the virus," Schooley says. "We don't know as much as we need to know about how to make uninfected people make the same kind of responses." AVAC, an advocacy group pushing the development of an HIV vaccine, said this latest failure "is a reminder of how challenging it is to develop an effective AIDS vaccine." "This trial has provided a clear, swift answer about a specific vaccine strategy," says Mitchell Warren of AVAC. "It's not the answer we hoped for, but the search doesn't end here." In fact, the search will continue with a careful dissection of the data gathered by the latest study. Hammer says researchers will look at whether some people who got the vaccine were protected, and whether the vaccine produced the expected immune response. "Did it put pressure on the virus, but then the virus escaped?" he wonders. "We've got a bunch of things to do to figure this out." To help with that task, the researchers are going to be talking with all 2,504 volunteers in the hope they can be persuaded to be poked and prodded for at least another couple of years to follow their responses and their risk of HIV infection. The researchers will also redouble their efforts to get study volunteers to avoid risky behaviors that could expose them to HIV, given the clear evidence that the vaccine didn't protect them, and could have increased their risk of infection. Meanwhile, this latest bad news "will throw the field into another round of discussion" about what to do next, Hammer says. What it will not do, he says, is reduce the drive to keep trying until scientists come up with a vaccine "that gives us solid protection" against multiple strains of HIV. "That will be a very joyous day," he says.